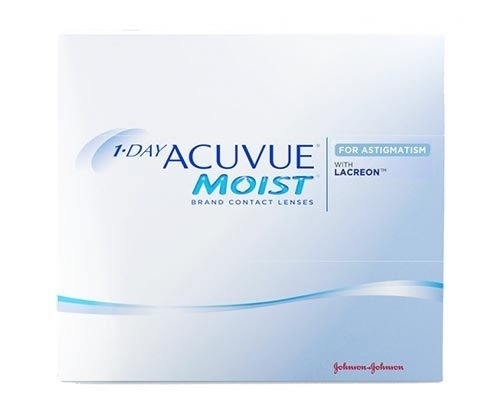 Acuvue Moist daily disposable contact lenses for astigmatism Designer Frames, Sunglasses, and the Latest Contact Lenses from MD Optix! Along with the convenience of no solutions and no lens cases,1-Day Acuvue Moist for Astigmatism infuses Blink Stabilized lens design and the exceptional comfort of Lacreon Technology to give you consistently clear and comfortable vision from the moment you put them in, to the moment you toss them at the end of the day. • 6 boxes/eye is a 6-month supply/eye. • If you can find this product being sold for a lower price, contact us and we'll do our best to match it. • This product usually ships in 3-5 business days. • You can return any purchase within 30 days. For more information, visit our returns page.